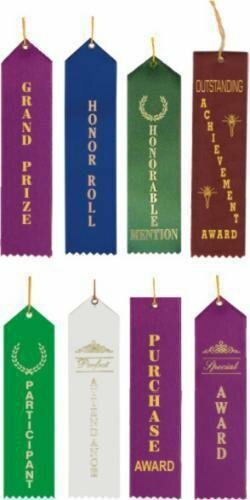 Award ribbons pre-printed with gold text. A card on the back has a place for you to write in the date, event and participant's name. Custom ribbons are also available per quote. Custom ribbons printed with your text on your choice of ribbon color have a minimum order of 50 with 2 weeks production time. Please call to order custom ribbons.